About 1,000 migrants have tried to force their way into the Spanish enclave of Ceuta bordering Morocco by storming a wired border fence. Local officials say dozens of security forces from both Spain and Morocco have been injured. 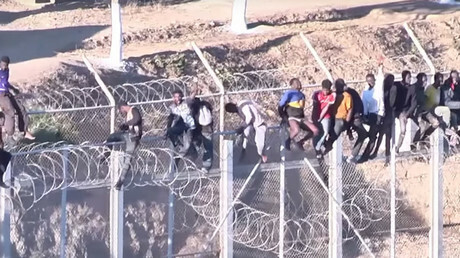 Crowds of migrants approached the 6-meter-high barbed wire border fence early Sunday and tried to break into Ceuta in several places. The local officials called the attempt “well organized and violent,” local news outlets write. Migrants tried "to force open some of the doors in the external fence, using iron bars, wire cutters and large stones,” a statement by Ceuta government said, as cited by the local media. The refugees then assaulted Moroccan security forces as well as Spanish police (Guardia Civil). At least five Spanish officers have been injured as a result, Ceuta officials said. Two of the refugees have been allowed into the enclave for medical treatment. The Moroccan Interior Ministry said the number of migrants who tried to enter Ceuta totaled 800 and that all of them have been arrested, Reuters reports. The ministry added that 50 of its security forces have been injured in the clashes. Ten are in critical condition, while one has lost his eye. "From now on, those making such attempts will be presented before the competent judicial authorities who will decree their expulsion from the kingdom [of Morocco] or heavier penalties, according the gravity of the act," Reuters quoted the ministry as saying in a statement. During the course of the day, dozens of migrants managed to climb the first line of the barbed wire fence. A video by RT’s Ruptly news agency shows migrants later lifted by the crane from the fence. In a separate incident, Moroccan police arrested a local woman who tried to smuggle a 19-year-old migrant from Gabon in a suitcase, Reuters reports, citing local officials. Last month two Spanish police officers and dozens of migrants were injured after around 400 refugees tried to make their way into Ceuta. Ceuta is alongside another Spanish enclave in Morocco, Melilla, one of the most common spots for African migrants trying to reach Europe. The attempted crossings into the enclaves have resulted in repeated injuries and even deaths. According to the UN High Commission for Refugees (UNHCR), the past year turned out to be the deadliest on record with regard to the number of refugees drowning en route to Europe. The organization estimated that over 5,000 migrants lost their lives after trying to cross the Central Mediterranean Sea.